I needed a change from Maybelline Colossal Kajal and the Lakme Eyeconic. When I saw this adorable red colored beauty at the store, I instantly grabbed it. This is my very first product from the brand Faces Canada. I’ve used it and loved it enough and I think its time to share my experience with this product. After getting satisfied with the Lotus Herbals White Glow gel, I wanted to try another product from the White Glow range. Since my hands are badly tanned I wanted a body lotion which has SPF in it.When I saw that this Lotus one had an SPF of 25 in it, I went ahead and purchased this. Prior to this, I was using only Vaseline body lotions. Let’s see how well it has worked out for me. I’m back with another product review. Lakme Insta Liner was my very first eyeliner and I still am using it. In between I switched to pencil kohls but I feel that this one suits for my everyday use. So lets move to the review. Ever heard of this term? “Hormonal Acne?” I have but I was not quite sure what exactly it meant until I got it like 3 months ago. According to me Hormonal Acne was something that appears on the cheeks and forehead of a teenage girl and it probably starts at the age of 14-16. If you are having the same opinion as me, you’re not wrong but it is not only restricted to this thought. I’m in my mid 20’s and around 4 months ago I felt that my skin was not clear and found tiny bumps on my jawline while washing face. Those bumps were actually not visible but I could feel it whenever I touch my jawline. They were tiny but there were many. I thought that it was due to summer (It was the end of may) and didn’t care about it much. Then I started getting big bumps on my chin (3 at a place to be precise) and it was no normal acne. It was white, kind of like a heat bubble. Again I thought that that was a heat bubble. But then, it started occupying all over my chin and jawline added to my woes. I didn’t get it on my cheeks or forehead or nose but only on my chin and jawline. They were actually so many, around 30-40 (yes, I’m serious 😦 ) I had no idea what the hell was that and went to a dermatologist. She gave me Benzoyl Peroxide. I used it nearly a month but it only got severe. Moreover Benzoyl Peroxide was harsh on my skin that I had to use a moisturizer before applying it. I also tried some home remedies like applying Neem and Turmeric. Nothing worked! I was reaching the end of my summer holidays and this thing on my face worried me a lot. It actually looked like a kind of “Pox” 😦 On the reopening day of college, everyone started asking me about this and that’s it. I decided to go to another dermatologist the next day. She initially checked whether I was allergic to something. Later on, she confirmed that this is completely due to Hormone Imbalance as only such reason affect the chin and jawline. As she said it had only occurred on my chin and jawline so badly. 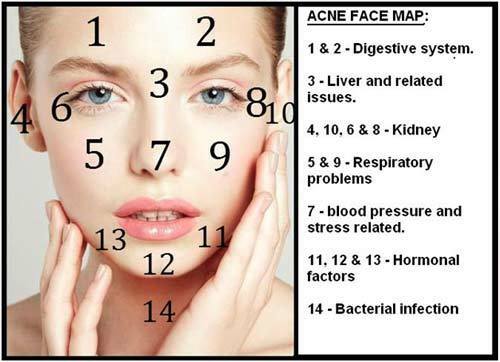 Then I googled about hormone imbalance acne, and I found a ‘Face Map‘ that says why it occurred on my chin and jawline. You can see the face map below. Most of the websites said that the imbalance is due to the excess of estrogen/ male hormones (yes, it said women body does produce both male and female hormones) and blah blah which i don’t understand. I went to a Gynocologist and she told me that women who have excess hair on their hands, legs and upper lips generally have some hormone imbalance (excess hair is due to more male hormones that is naturally there in their body). Whatever is the reason, now I’ve been taking medications for 3 months which works quite well. My bumps turned to dark spots and now I see that those spots are lightening slowly. I was also prescribed Krimson 35 (birth control pills) to balance my hormones. I’m quite happy with the result. Because of this reason, I stopped using any cosmetics/products on my face. I was not able to test any products or post any review of them – the real reason behind 3 months of silence from this blog. I’m posting such a long post because when I was affected by this acne, I was desperately looking for information whether this has happened to anyone or its just me. I think that this post may help someone. Budget beauty products are something we cannot stop giving attention. Almost all of us wants to own a good branded product with reasonable price. Not only the price of the product pays an important role but its effectiveness. So here in this post, I’m going to list 10 budget-friendly products that I have been loving lately. I’m going to write this post as a series as there are a lot of best budget beauty products available in the market and I would love to explore them!